I got the letter confirming Little Prince's place in nursery. He starts in September but has two practice days at the end of this school term. You know what? September can't come quick enough! That might sound like a terrible thing to say but, at the moment, it's how I feel. I'm ready for a few hours a day where I can drink a cup of tea in peace. I'm ready to sit in the house and listen to the birds outside or watch something on the TV. What makes this all the more exciting is I’ll have more time for writing. I’ll be devoting the free time to my stories and hopefully get them finished faster. There are so many things I'm looking forward to but being child-free is top of the list! I will be able to sit and think of no one but myself. This new phase will be good for LP too, he is ready to be going to school every day. When I take his brother he asks if he is big enough yet and every day I have to tell him “Not quite.” Then the tantrums start. When LP is in nursery I will worry and fret. I'll hope he is getting on OK and wonder if he is making friends. As he says goodbye to me every morning and totters into school with a smile on his face I will walk away with tears in my eyes because my baby is growing up. I'll wish for the days when he stared up at me from his moses basket or the times when we sat on his activity blanket playing with his baby toys. I'll find it really difficult to let him go because this time there will be no more babies. When my eldest started nursery I loved it and I didn't worry about letting him go. I knew he had to grow up sooner or later and, although I was sad, I watched as he made friends and became a 'big boy'. At that time the Hubby and I were already planning our next baby so I didn't need to mourn the baby days. I could enjoy the free time and remember him being a baby without feeling sad, but now things are different. We have no plans for any more children. I will watch them both grow and become more independent every day. As the years go by they will need me less and less and I find myself wishing that wasn't the case. This is a phase I'm sure all parents go through. While they are newborns we wish for them to grow and be more interesting, to start moving around or playing with toys. Once there, we want them to start walking, then onto the nappy-free days. When they start school and we have that spare time to ourselves we realise that we have spent the last three years wishing our babies lives away. We've hurried to the next interesting stage so we can find out new and exciting things about our children. What we fail to realise is we should be spending our time enjoying the stage they are at NOW because before you know it they will be going off to university. Enjoy the newborn stage because when you look back you realise that it passed far too quickly. They are small babies for a very short time and we should cherish it. Savour the time when they're not-yet talking because as soon as they learn how to get their words out there's no stopping them. You won't get a moment's peace in the day! I love my children and always try to enjoy the stages they are at. However, sometimes I find myself either wishing their lives away or wishing for a time gone by. 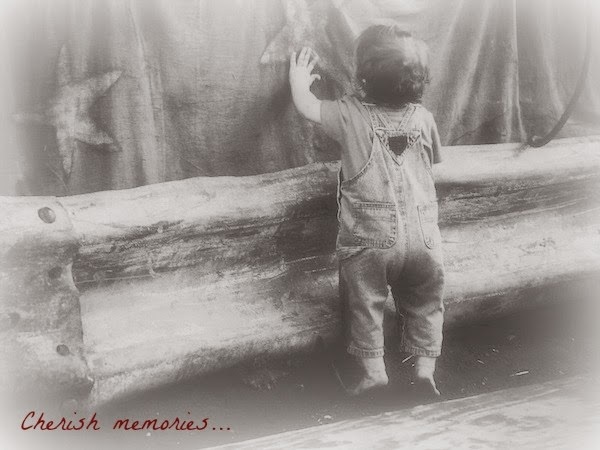 It's these times when I remember those precious moments that have a special place in my heart. They make me sad that I will never see my children like that again. I have to slap myself and remember that we all have to grow up and I should be enjoying every second with my kids, creating new precious moments and keeping them in my heart too. We should remember those baby days with fondness and at the same time take notice of our children's new abilities and remember those too. Hold onto those memories because when we are old, sitting in that armchair enjoying a visit from the great grandchildren, we will be able to look into the eyes of the toddler standing before us and see our children as they once were. We'll re-tell stories to the next generation and smile when we remember that time 'he fell in the canal!' watching as our great grandchildren laugh at the idea of their grandfather falling in the canal. Those are the times I look forward to the most. What precious memories do you have? Look forward to where they're going. It's all good. We love our children always. Need a break from them often. And miss them more than we realize. I know I will miss my youngest terribly when he starts going to nursery but it will be great for him.